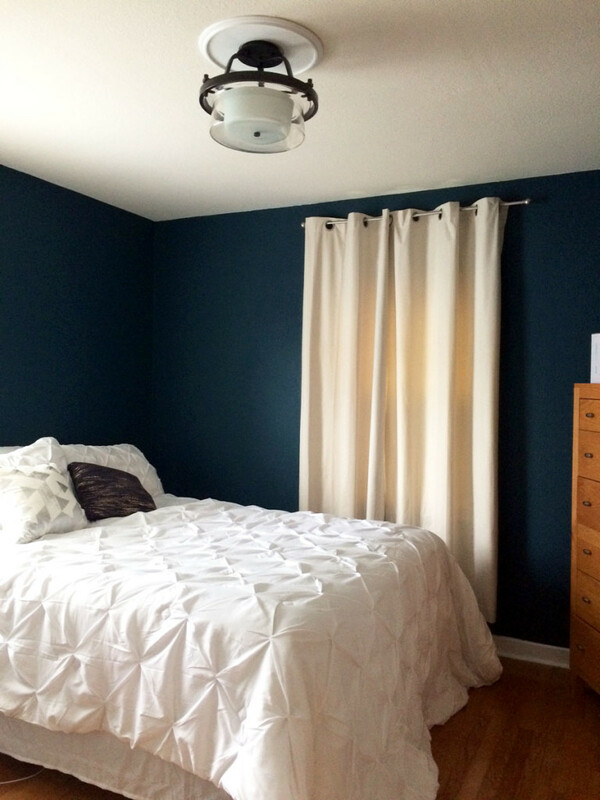 I’m three weeks into my navy bedroom room makeover, and I’m thankful to still have a ceiling! 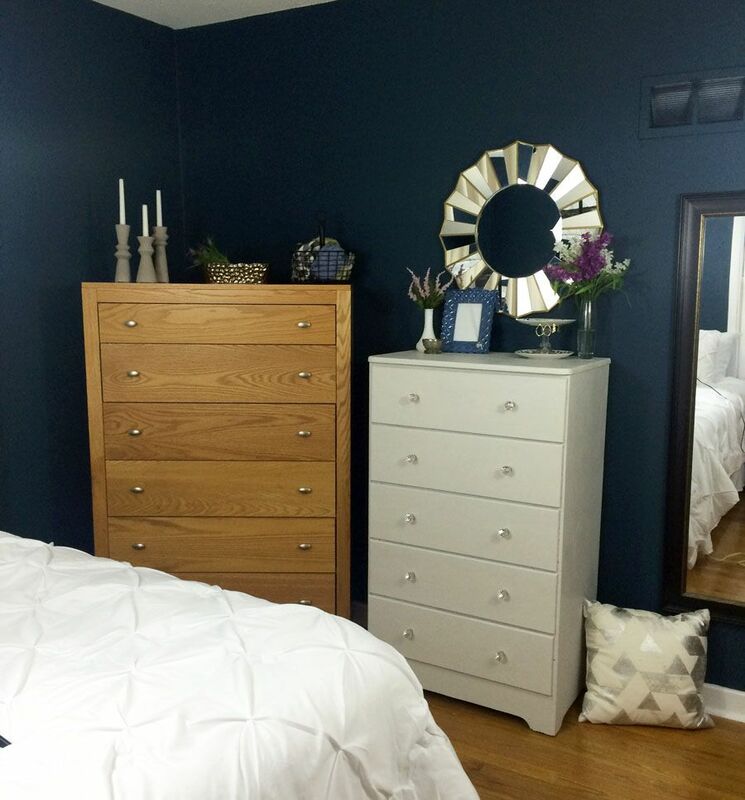 It has been quite the week of projects in our bedroom, and, with just two weeks left in the One Room Challenge, I’m feeling really good about how it’s coming together. I’m at the point where the room is starting to look functional again, much better than the tornado that tends to ensue whenever I dive into a decorating project. Does that happen to you? 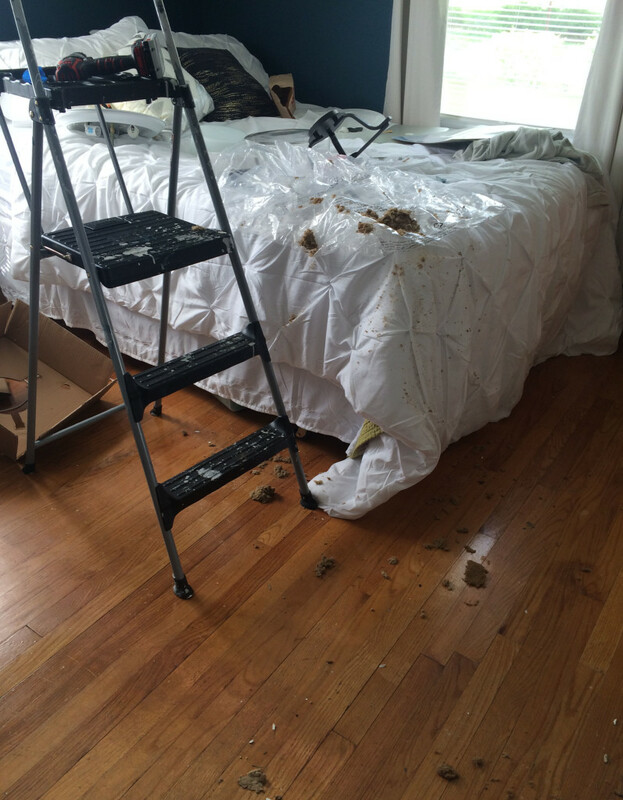 If you want to start at the beginning of this room makeover, see updates from Week One – Week Two – Week Three. 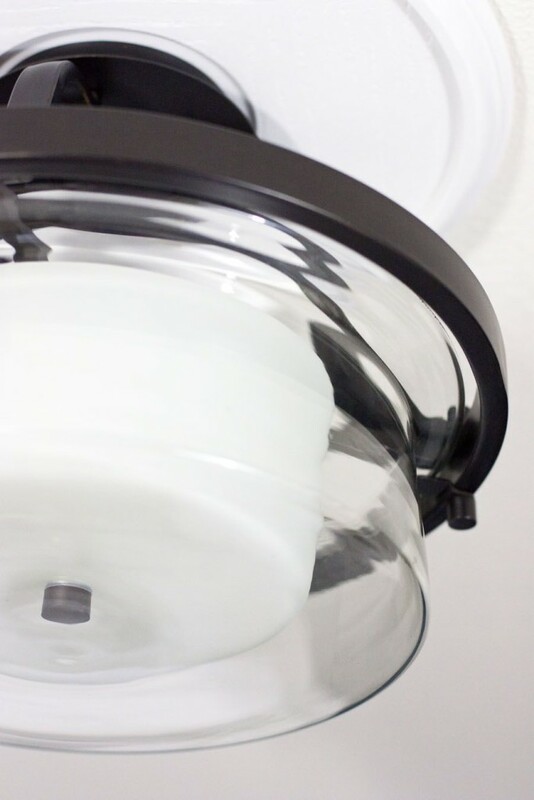 On Sunday, I convinced my husband to help me with the project that most intimidated me in this whole room makeover – replacing the ceiling light fixture. I’m a homeowner newbie and am still getting my feet wet in the home improvement area, so the light fixture was a good project to have under my belt. The folks at 1STOPLighting.com were kind enough to provide a gorgeous new fixture for my bedroom makeover. 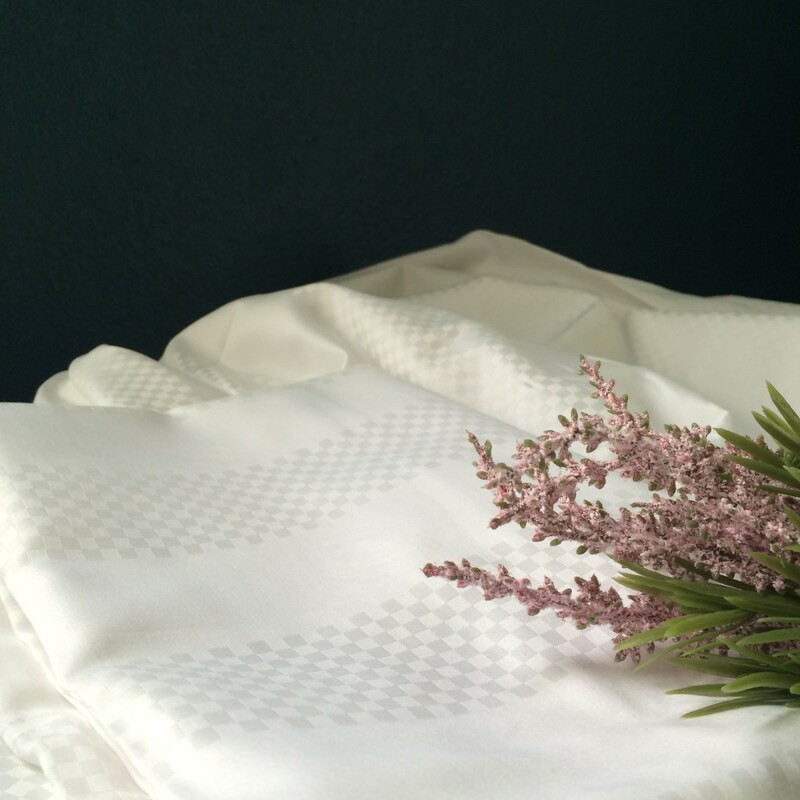 When the package arrived on my doorstep last week, I could hardly wait to see what the light looked like installed in our bedroom. 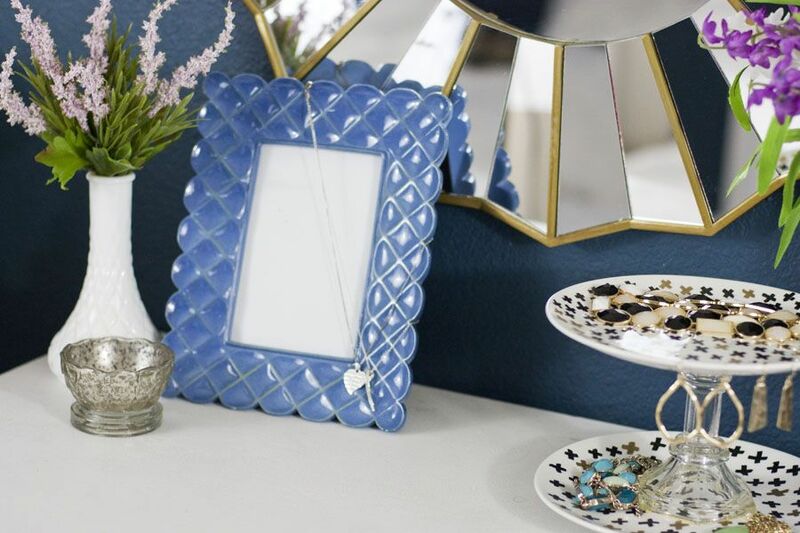 I love the name of this fixture: Indulge. We had an older junction box, and ended up having to pull it out of the ceiling to make this installation happen. Of course, a flurry of insulation rained down on us when we removed the box. And all over my white bed! Although we ran into some difficulties, we did successfully hang our new light and were so excited when we flipped the breaker and it turned on! Phew! I love the layered glass globes, and the metal has a brown/black brushed finish. It’s simply gorgeous. This week has been really rainy and cold, which put a damper on my original plans to start building a headboard in our garage. 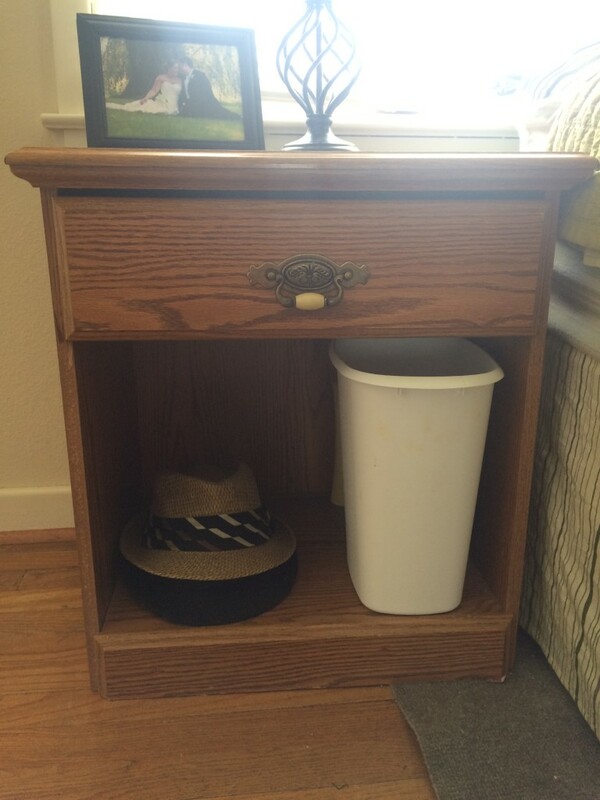 So I instead turned my attention to refinishing our nightstand. It looks so sharp and refreshed with a coat of a grey one step paint by Amy Howard. I very lightly dry brushed a light grey paint on top, which gave the dresser a slightly weathered look. I also replaced the ugly drawer handle with a matte chrome pull from D. Lawless Hardware. Oh, and I found that basket on sale at Michael’s. I didn’t buy it for the nightstand, but decided it looks great and fits perfectly on that shelf. Any ideas for something to decorate the wall in the corner behind David’s dresser? 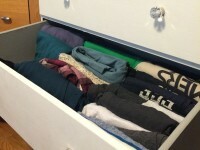 Since the dresser is angled, the wall behind it is a bit tricky to decorate. But it feels pretty dark back there, so I’m trying to think of an idea for that wall. 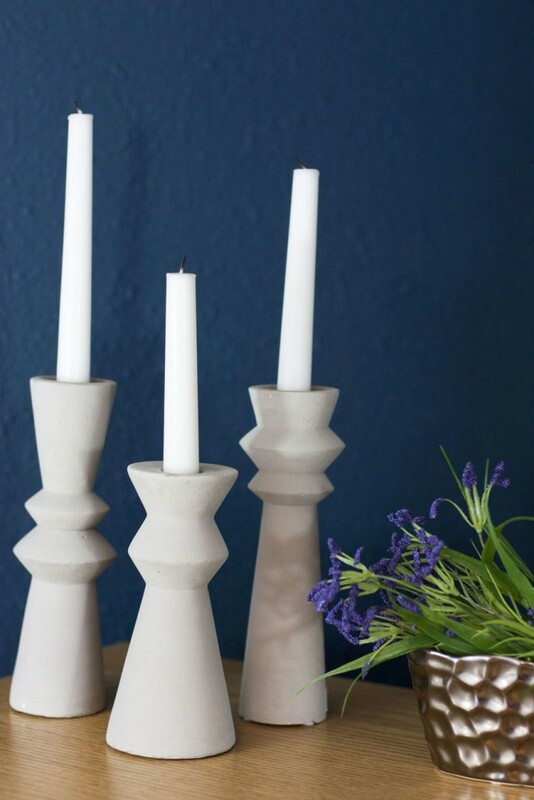 I’m still working on styling the top of David’s tall dresser, but I do want to show you these beautiful concrete taper candleholders. 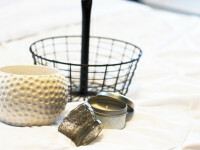 They are from Merely Modern, an online home decor boutique, and their products are all so elegant. 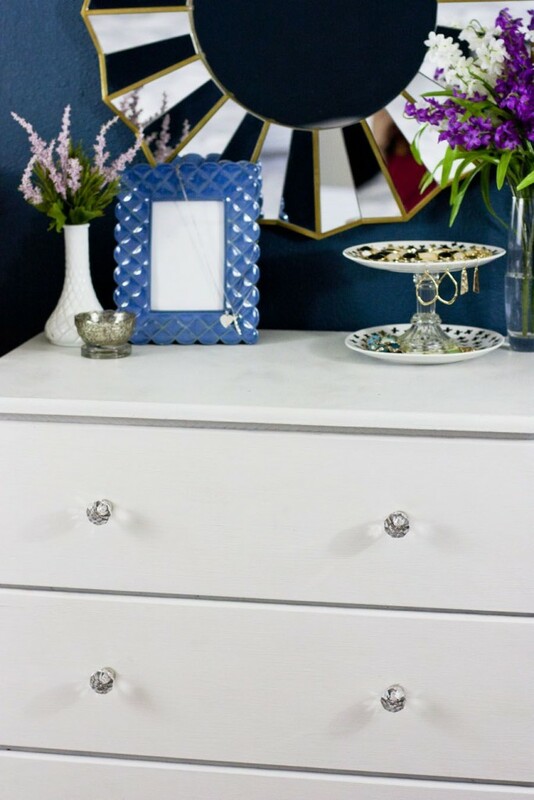 I was shopping last Friday and found some beautiful accessories for this room, which made it fun to style the top of my feminine white dresser. Doesn’t it look gorgeous? Pretty sure I’m done styling the top of my dresser. 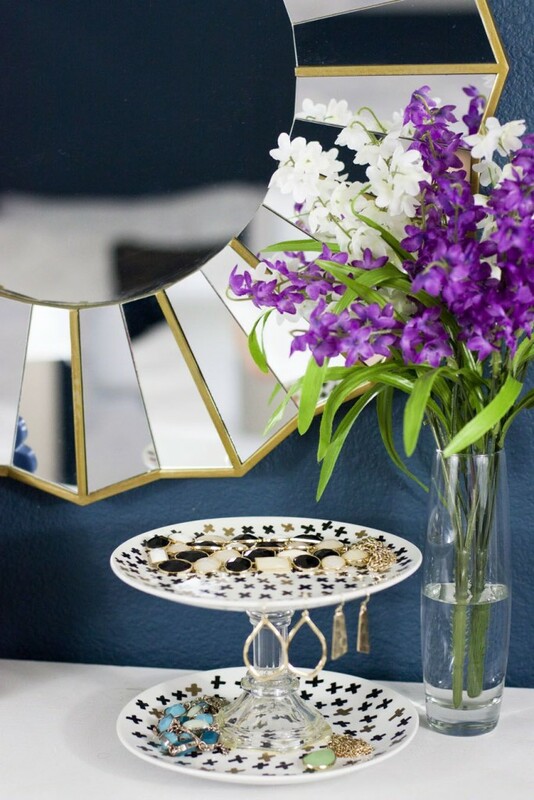 The flowers, frame and sunburst mirror were all found in clearance aisles last weekend, and that jewelry try is a thrifty DIY project (tutorial here). I’m so happy with how my painted dresser turned out. 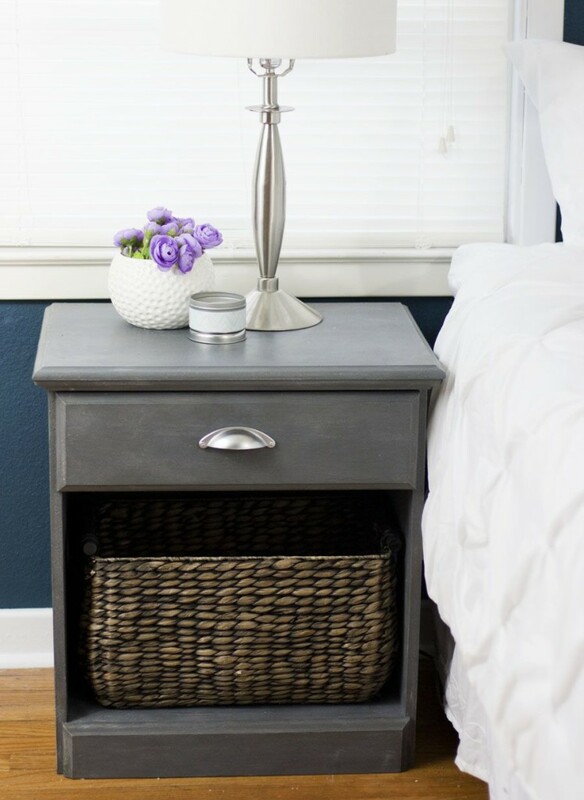 I used this white one step chalk paint from Amy Howard, plus some leftover grey paint for the insides of the drawers. 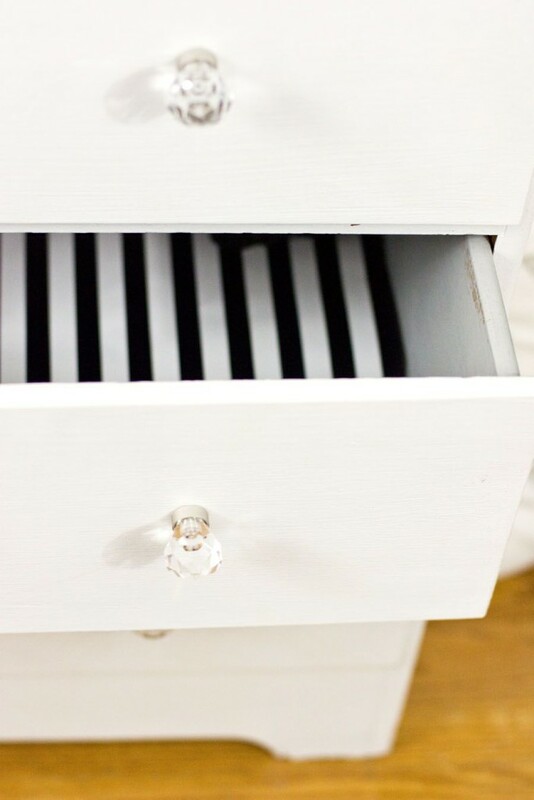 I lined the drawer bottoms with striped wrapping paper, and the finishing touch is the lovely diamond acrylic knobs from D. Lawless Hardware. While I had the tools out to replace our light fixture, I also drilled in a couple screws to hang my mirror. I’ve always had it leaning against the wall, which is okay since I’m super short. But it feels a lot more finished when it’s hanging neatly on the wall to the right of my dresser. So that’s my update for this week! 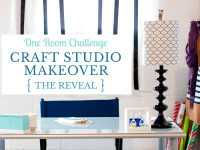 With only two weeks left in the One Room Challenge, I’m in the home stretch. In the coming week, I must make major progress on building a headboard since that’s the one big project left that I haven’t even started. I’m working on styling the little white shelves between our closet doors and door to the hallway. 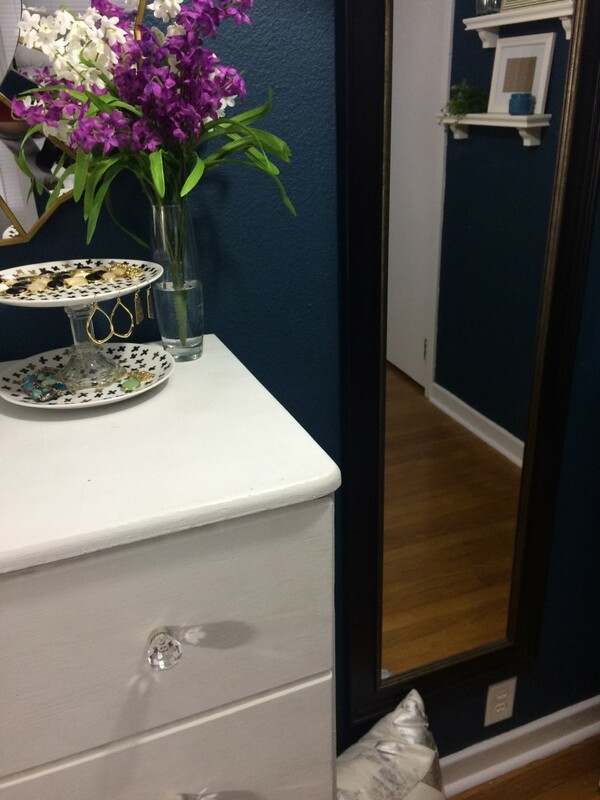 You can see them in the mirror reflection in the above photo. I’m also refinishing a thrifted piano bench that fits perfectly on that little wall underneath the shelves. Oh, and I need to build a super small nightstand to fit in the back corner between our bed and the wall. I think the only other project I’m still planning to do is paint the door black or super dark grey. My grand plan is to paint all of our interior doors that color, along with spray painting the ugly old hardware something classy. Lastly, thank you to 1STOPLighting, Merely Modern and D. Lawless Hardware for providing product for this room makeover. They’ve really helped me decorate this room in style! 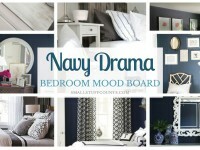 What do you think of my navy bedroom? Any ideas for that wall behind the dresser angled in the corner? What do you think of the new light fixture? 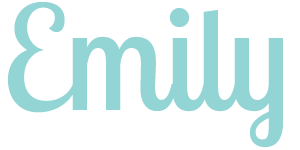 If you want to see more room makeover goodness, go check out the progress all of the other bloggers have made on their One Room Challenge rooms this week. I love all the touches you’ve added to the space! 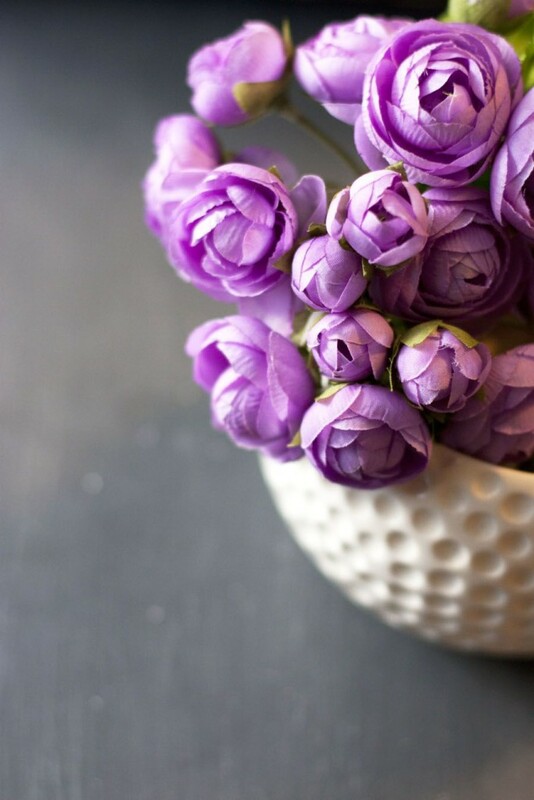 Perhaps a plant at the back edge of the dresser? Good luck!